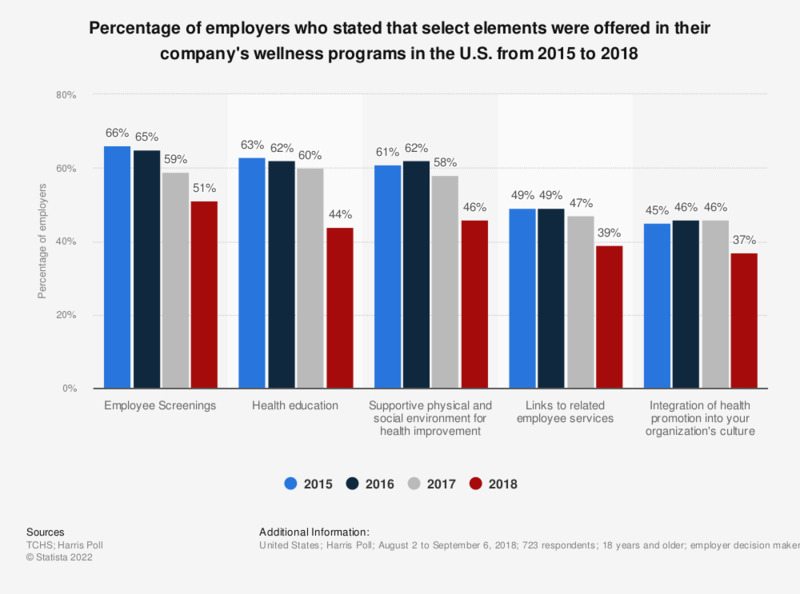 This survey shows the percentage of employers who stated that select elements were offered in their company's wellness programs in the U.S. from 2015 to 2018. Around 50 percent of wellness programs offered by companies provided employee health screenings as of 2018. Original question: Which of the following elements are offered as part of your wellness (health promotion) program? Please select all that apply. What would get you to engage more in your wellness program? Which activities does your wellness program not incentivize financially? How is the wellness (health management) of your company funded? How often do you want your wellness program to send you specific actions to take to maintain/improve your health? How often do you log into your wellness program? What is the main reason for your organization not currently offering a wellness (health management) program?